The elegant villas have long gone, replaced by soulless seafront apartments, but the 1908 funiculaire, with its Parisien Metro style of architecture, has recently been restored. 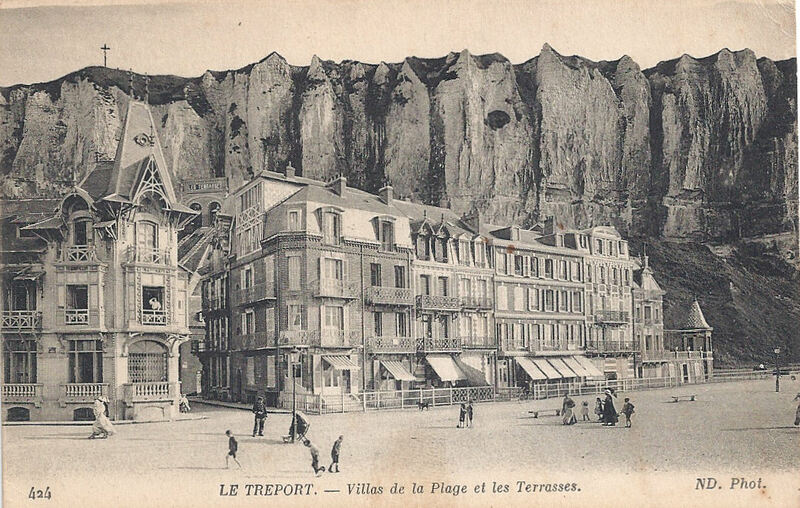 In its heyday it transported summer visitors up to the spectacular hotel Trianon on the cliff tops. I was amazed to come across this card [below] recently. 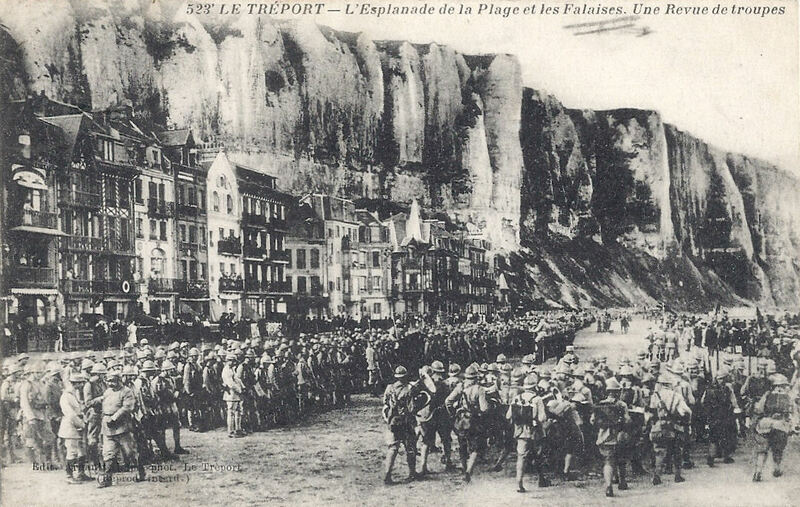 It was an insight into wartime le Tréport and something I hadn’t ever considered. I thought of the convalescent British and Canadian soldiers venturing out of the Trianon and the huge assembly of associated hospital tents on a warm day, taking in the sea air on the cliff tops, perhaps being able to glimpse the cliffs of England if it was a clear day – and then this, happening directly underneath, this vast number of troops on a promenade to a pleasure beach. The confusion of noise… the feet marching, the orders, the clinking of equipment… the waves relentlessly rolling onto the beach and perpetually breaking on the lighthouse promontory, oblivious to all wars. Most balconies are busy with spectators and groups have gathered on the pavement. Curious onlookers crowd and spill over on to the beach. Do any of them know a soldier, I wonder? You can just see the tunnel of the funiculaire to the left hand side of the picture. I have a bit of a suspicion that the plane is a later addition! I haven’t been able to find out what the event was* (apart from a review of troops). The card was posted in 1917. The image is credited to Arnault, a commercial photographer in le Tréport. I own this particular card but it’s been reproduced in the collection of an Alice Isaacson, so I assume that the picture was readily available for interested purchasers at the time. *Edit: please read comment by Jean-Luc below. This postcard by Arnault was taken in August 1916. This is the muster inspection of the 20th French Corps, which was resting in the region. Ah! Jean-Luc… how is the Le Treport book doing? Thank you! I’m grateful for the information. Do you know where the units went after their rest period? Somewhere (so safe I can’t remember where it is 😮 ) I have a bracelet my G-Uncle had from his time in the No. 2 Canadian hospital on the cliffs. It looks like a 1F coin on one side, but the back is engraved ‘Journee du Treport’ and dated a specific date in 1917. I’ve often wondered what the journee was…. Seeing this photo made me wonder if the event pictured was a regular event, or a one-off. i.e. if it was a one-off, could this be the journee, and the bracelet was a memento. When I find it, I’ll check to see the exact date. Certainly the beach was popular for swimming parties, and the odd person fell from the top of the cliff (as mentioned on GWF! )…… Alasdair (‘Le_Treport’ on GWF). Do you mean wartime swimming parties? I have pre-War pictures of families in little boats: very idyllic. I have a soft spot for this area as Mont-Huon was the very first war cemetery I ever saw, in about 1987, on my first ever visit to France, staying in Mesnil-Val in an old fashioned, popular hotel which has since….. changed somewhat. At that time I knew nothing. I had no idea the ruins had been the Trianon and then a hospital, but on those remains of steps, I experienced a feeling of real panic and chest pressure and it all felt terribly charged. Spooky really. Many postcards about the british and canadian hospitals. Thank you for alerting me to this! I’ve found an alternative link and edited the original post.